In the Directed \(k\)-Chinese Postman Problem (\(k\)-DCPP), we are given a connected weighted digraph \(G\) and asked to find \(k\) non-empty closed directed walks covering all arcs of \(G\) such that the total weight of the walks is minimum. Gutin, Muciaccia and Yeo (Theor. Comput. Sci. 513, 124–128 (2013)) asked for the parameterized complexity of \(k\)-DCPP when \(k\) is the parameter. We prove that the \(k\)-DCPP is fixed-parameter tractable. We also consider a related problem of finding \(k\) arc-disjoint directed cycles in an Euler digraph, parameterized by \(k\). Slivkins (ESA 2003) showed that this problem is W-hard for general digraphs. Generalizing another result by Slivkins, we prove that the problem is fixed-parameter tractable for Euler digraphs. The corresponding problem on vertex-disjoint cycles in Euler digraphs remains W-hard even for Euler digraphs. 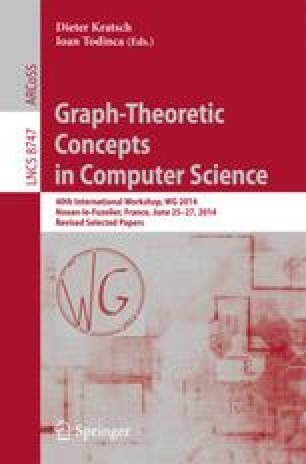 A full version of this paper appears at http://arxiv.org/abs/1402.2137. Research of GG was supported by Royal Society Wolfson Research Merit Award.